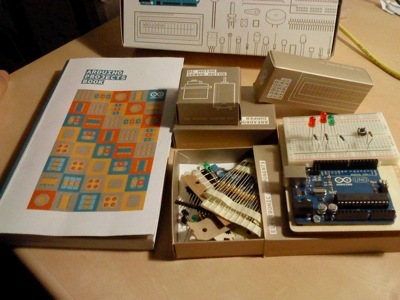 Ardui­no cre­a­tors have recen­tly laun­ched the new Ardui­no Star­ter Kit, a kit com­pri­sing all the com­po­nents nee­ded for a com­ple­te intro­duc­ti­on to the world of elec­tro­nics and the Ardui­no con­trol­ler board, even if you don’t have any spe­ci­fic kno­wled­ge of it. Spe­ci­ally if you don’t have any kno­wled­ge of it. 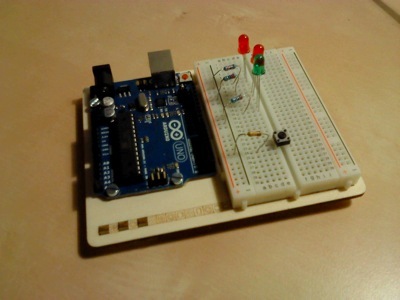 Sin­ce I have been playing around with an Ardui­no tuto­ri­al, trying to remem­ber all that I had for­got­ten of my Engi­ne­e­ring edu­ca­ti­on and star­ting my own “recon­nec­ti­on” to elec­tro­nic tin­ke­ring, I was con­si­de­red the per­fect AltLab mem­ber to be given the oppor­tu­nity to try it out and revi­ew it. You can get the com­ple­te and exhaus­ti­ve list of com­po­nents on the kit web­pa­ge if you want. The first thing that caught my atten­ti­on was the impres­si­ve looks of the kit. 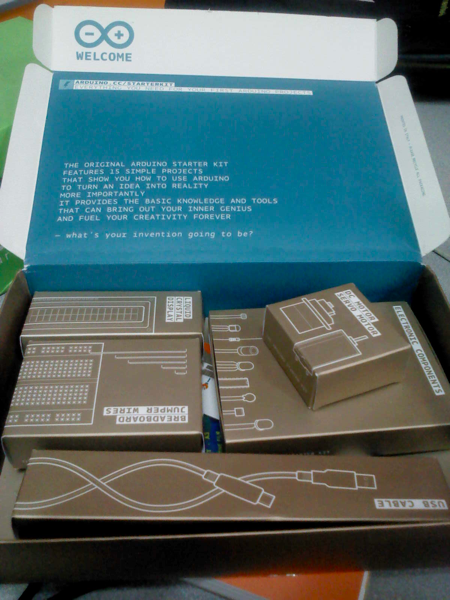 Coming in a good qua­lity prin­ted card­bo­ard com­pact box, it seems more of design pro­duct than a elec­tro­nics intro­duc­ti­on kit. This would also be my fee­ling throughout the rest of expe­ri­en­ce: com­pa­red to the my own star­ter kit, whi­ch I bought in a hack-fest, this seems like com­pa­ring a Land Rover to a Lada Niva. They both per­form the requi­red work , but one is con­si­de­ra­bly nicer than the other. Left pic­tu­re shows how all of the kit dif­fe­rent com­po­nents come in indi­vi­du­al old-gold colo­red boxes, nicely pac­ked and orga­ni­sed. 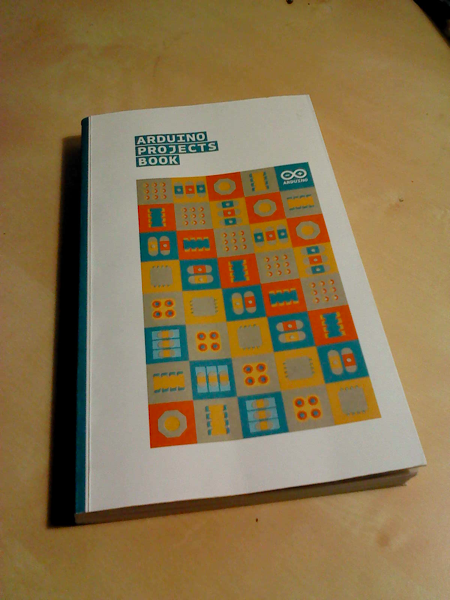 The book itself is more of a “artis­tic” book than what i would expect for a elec­tro­nics intro­duc­tory tuto­ri­al. Being used to the engi­ne­e­ring “cut & dry” manu­als, this actu­ally sur­pri­sed me the most. I’ve glan­ced though the intro­duc­tory chap­ters in the book and played a bit with the more advan­ced expe­ri­ments on the book sin­ce I alre­ady had mas­te­red the basics Ardui­no. I even asked a “lay” fri­end who was curi­ous about the Ardui­no world to try it one after­no­on. The sim­plest sta­te­ment is that it duti­fully ful­fills its goal of intro­du­cing you to the Ardui­no. The book tri­es its best to cle­arly explain the basics of elec­tri­city and elec­tro­nics in a way that actu­ally makes sen­se for “mere mor­tals”. My “lay” fri­end quic­kly unders­to­od it and although she had some misun­ders­tan­ding with the bre­ad­bo­ard inner con­nec­ti­ons at first, after the bri­ef hours that i let her alo­ne with it, i found her hap­pily doing cir­cuits invol­ving mul­ti­ple LEDs and resis­tors and some weird pat­tern of blin­king. Her and I though, had some trou­bles with the low-cut /fixed length jum­per wires that were inclu­ded in the kit. Although its goal is to make the bre­ad­bo­ard con­nec­ti­ons easi­er and cle­a­rer, we found out that it actu­ally makes it har­der to a “new­bie” to work with. By for­cing some fixed lengths it either makes con­nec­ti­ons errors more pro­ba­ble or for­ces us to care­fully fol­low the dia­grams and colors right to the mil­li­me­tre, not lea­ving spa­ce for impro­vi­sa­ti­on and sim­ple foo­ling around. Also, I must say that the code pages are not suf­fi­ci­en­tly sig­na­li­zed, sin­ce they are inser­ted after the cir­cuit assem­bling and pro­ject pic­tu­res as if it was alre­ady done. Sin­ce the first book pro­jects didn’t use any code at all, the first pro­ject that did pro­vi­ded me with a pho­ne call from my fri­end asking me why she didn’t mana­ge to get expe­ri­ment wor­king at all, even after care­fully redoing everything twi­ce and men­tally fol­lowing the “flow of elec­tri­city” throughout the wires as i showed her. The­re was no indi­ca­ti­on of code, and sin­ce she didn’t actu­ally unders­to­od how it rela­ted with it, she didn’t turn the page to look for it. I did noti­ce the same thing when i star­ted using the book, but i alre­ady knew that the code had to be somewhe­re. On the who­le, the pro­jects itself are inte­res­ting and amu­sing, even without the colour­ful and sligh­tly chil­dish deco­ra­ti­ons inclu­ded in the kit, and pro­vi­de you with fun­da­men­tals to start buil­ding more advan­ced stuff. The light the­re­min sounds hide­ously though! 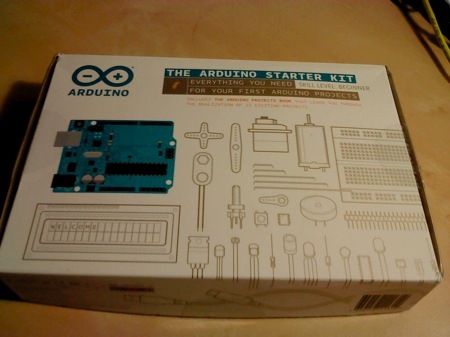 If you are alre­ady fami­li­ar with elec­tro­nics or you’re not afraid to start explo­ring it without a safety net, you can pro­ba­bly save a cou­ple of euros buying the Ardui­no board and other ran­dom sets of parts or kits from your local/online elec­tro­nics sto­re and just fol­lowing the ran­dom infor­ma­ti­on fre­ely avai­la­ble from the web. Howe­ver, if you are a com­ple­te new­bie to this bra­ve new world, or just want a safe gui­ded expe­ri­en­ce to intro­du­ce you, simi­lar to the gui­ded workshop you would get with a tea­cher, this is pro­ba­bly one of the best star­ter kits avai­la­ble. The pro­jects are inte­res­ting, cover most of the buil­ding blocks that Ardui­no pro­vi­des and it will lea­ve you per­fec­tly equip­ped to “higher flights” in this fas­ci­na­ting world of DIY elec­tro­nics. What are you still doing here? Don’t was­te your time, go get it.